It is that time of the year again when fun and excitement is all that matter, and with our exceptional New York Christmas Lights 2018 Limo package, you can expect to have the best memorable experience. We have a wide range of Limousines and exquisite Christmas bus tours in the city that you can choose from. You don’t have to worry about jumping public transport to get to the fun sights in the city; our professional chauffeur will be there to pick you up at your location and take you to the holiday destinations in the city. Enjoy a spectacular tour to Radio City Music Hall as you listen to amazing holiday songs with our NYC Holiday Lights sightseeing tour. Join the world-class Rockettes as they perform their original songs featuring beautifully designed sets, stage effects, costumes, and top-notch fun. You definitely will enjoy every moment of your time at the Hall. You also get to take a tour of the Christmas light decorations at the venue in grand style. The events open on November 10th – 13th, 15th – 30th, December 1st – 31st, and January 1st – 2nd. With our New York City Christmas Tours packages, you can be assured of the best experience. Fun and entertainment await you at the 76th Annual Rockefeller Center Christmas Tree Lighting grand ceremony. No doubt, this tree lighting ceremony is going to be a star-studded event that will broadcast live on the NBC. Thousands of fun lovers are looking forward to visiting the most popular tree in the whole world and to celebrate the holiday at the Rockefeller center. You can’t afford to miss out of the fun. With our New York Christmas Tours 2018 Limo Service, you can be assured of fun like no other. If you love ice-skating, you are in for an exhilarating season at Rockefeller Center. The Rockefeller Center Ice Skating rink attracts hundreds of thousands of people during this season. With a skating surface of 59 feet wide and 122 feet long, you cannot begin to imagine the experience. You need to be there in person to enjoy the feel and with our NYC Holiday Lights Bus Tour, you can have your friends and loved ones ride with you to this center in luxury. Situated at the EAB Plaza, this is definitely Long Island’s Rockefeller Center. You can enjoy the beautiful view of the tree from the back of our chauffeur driven limo. The Christmas tree at EAB Plaza this year is an amazing 80 feet fir that is illuminated by a total of 40,000 lights. You can start your fun by going on ice skating at the rink and after that, you can take a tour of the lobby which features seasonal displays of lights and Santa right before Christmas. If you are considering New York City Christmas bus trips this season, our luxurious party buses will be the best option for you. We will be delighted to arrange your exceptional NYC Holiday Lights Bus Tour this season. Our Long Island Holiday Tour Limo will be available to take you to your destination, including The Nutcracker, and of course, for Department Store Windows light tours. 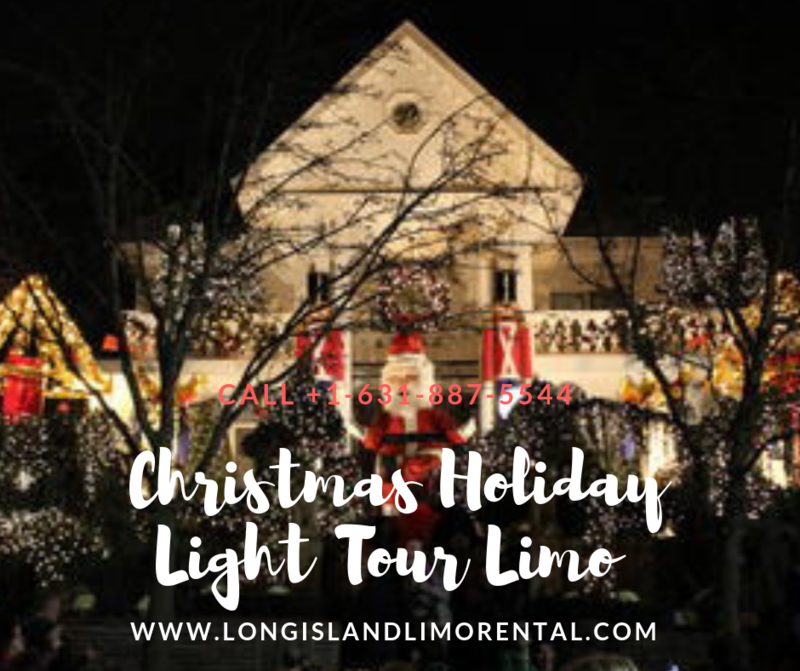 Other Holiday light tour destinations you can enjoy with our exquisite Long Island Limo include Brooklyn, Columbus Circle, Manhattan, and Staten Island.